Greater Fort Lauderdale&apos;s 300-plus miles of navigable inland canals - part of the Intracoastal Waterway - stretch from the Atlantic Ocean to the Everglades. A destination within a destination, the waterways offer everything from centuries-old mangroves to opulent multi-million-dollar mansions. They also connect the area&apos;s top activities, attractions, hotels, shopping areas and restaurants. It is easy to experience our water culture by staying in a waterfront hotel or enjoying our many waterway attractions. Lotsa yachts. Greater Fort Lauderdale is home to a multi-billion-dollar marine industry with more than 42,000 registered yachts. 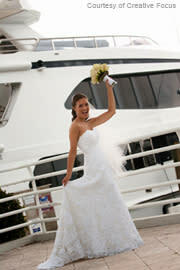 For luxe or more modest tastes, yacht rentals are both readily available and easily affordable for rehearsal dinners or wedding receptions - guaranteed to be an event that no one will forget.